I’m not sure when I decided that I wanted to sit in a hot spring, but I think it was a few years ago while reading a friend’s travel blog. It looked so amazing, and I think it’s really cool that these exist in nature. On my recent trip to Costa Rica (that blog post is coming soon! ), I made it a mission of mine to make sure I found some hot springs. 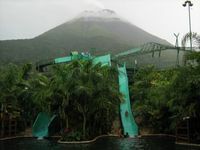 The opportunity arose when visiting the Arenal Volcano area in the city of La Fortuna. There were several options of hot springs available in different price ranges, so my husband and I decided to check out a middle priced one called Baldi. 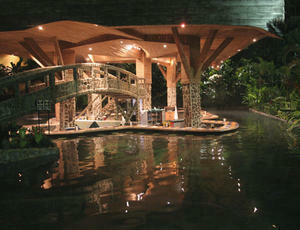 It was seriously the Disney World of hot springs! Although it didn’t really look as natural as I would have liked, it was still pretty awesome. 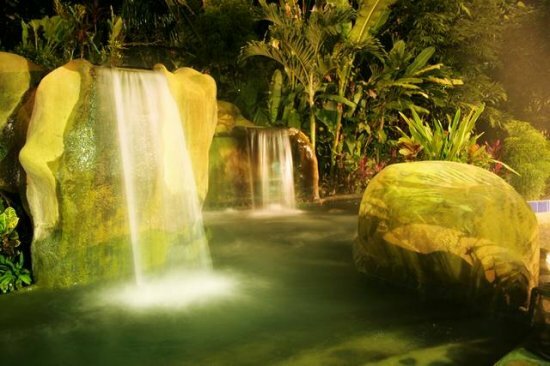 It’s located at the foot of the Arenal Volcano and has 25 mineral water pools (more like hot tubs) with gorgeous stones, lush tropical plants, and exuberant waterfalls all around. We hopped around from spring to spring and had a blast. I would definitely recommend that people visit the hot springs at night, because it’s cooler outside and the hot springs feel that much more amazing! The pools ranged between 12 different temperatures, and one was ridiculously hot! I could only put my foot in for a few seconds, before I couldn’t take it anymore. Along with waterfalls, some of the pools also had in-water beds to lounge on, cool pools to refresh, and one pool had three awesome water slides that were a blast! This made for an overall relaxing night after a long drive we had from Playas del Coco earlier that day. Unfortunately, I was unable to take pictures of Baldi, as I had nowhere to store my non-waterproof camera while hopping from pool to pool. You will have to settle with these images I found online. Wet Bar--one of the hottest pools!